I don't know about you, but I'm always on the lookout for easy meals to add to my weeknight repertoire, and I found a new dish to try on a lunch break last week. 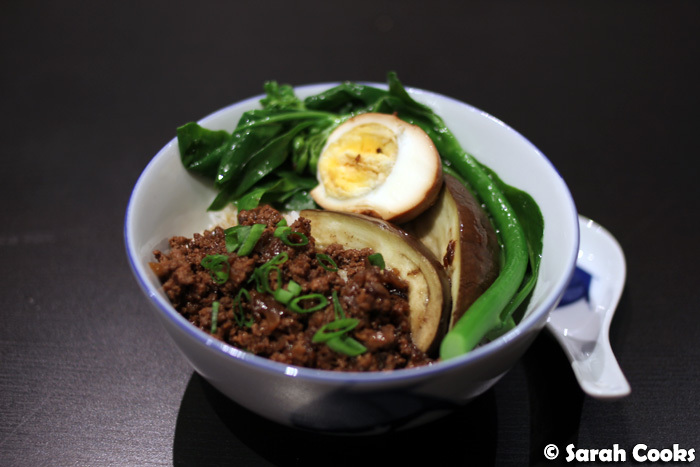 I'd ducked into Taiwan Cafe on Swanston street for a quick lunch on a very cold day, and I ordered a bowl of that Taiwanese classic, meat sauce on rice (with a soy egg, of course! 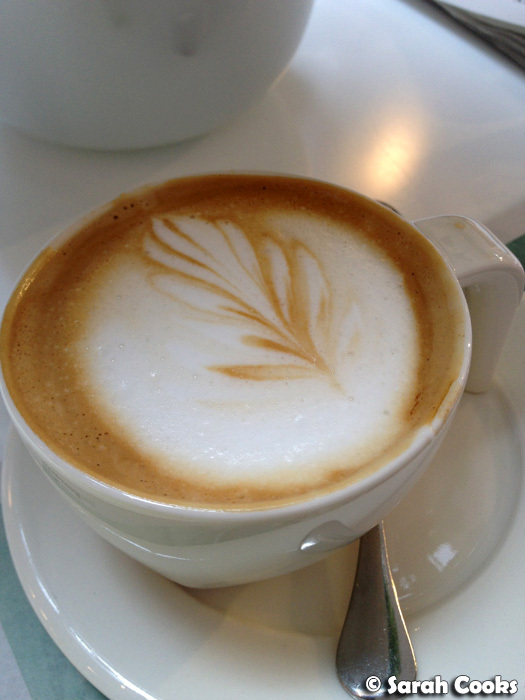 ), and a hot cup of Hong Kong milk tea. It was my first time trying it - normally I go for braised beef soup at Taiwanese places - and I really loved it! It was incredibly comforting, and very tasty. Looking at the dish, it didn't seem like it would be that hard to cook at home, so I googled it, found out that it was actually very easy, and made it for dinner that weekend! 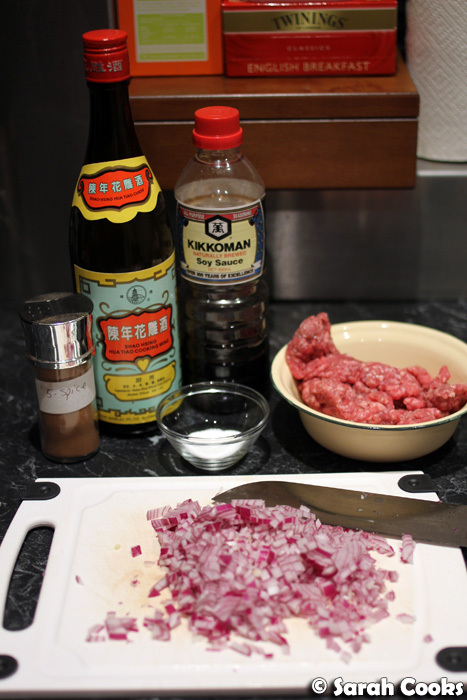 Being a classic recipe, there are as many versions as there are people who cook it, but a common theme is that minced meat is slowly simmered in a mixture of soy sauce and other aromatics, and that it starts with a base of crisp fried shallots. (Most recipes I've seen say to cook the shallots yourself, although I have seen others that suggest starting with a packet of those crisp fried shallots that you can get at Asian grocers). Pork is classic, but I used beef mince on this occasion, because I happened to have it on hand. Same deal with the red onion - I used that instead of shallots because I always seem to have a few knocking about. Here are the onions, browning away. Make sure you cook them until really good and brown, as you can really taste it in the finished product. There is a high ratio of liquid to meat, and the sauce takes about the same amount of time to cook as it does to cook soy eggs, so it makes sense to chuck it all in together. (I love soy eggs, but it always seems wasteful to use so much soy sauce just to simmer a couple of eggs - it felt much less extravagant cooking the eggs and meat together in the sauce!) I only did two eggs as there were two of us eating that night, but the recipe makes enough meat sauce to serve four people, so in my recipe below I've suggested doing four eggs. And that was it! It's a delicious, low-effort dinner. From start to finish it takes about an hour, but you're only actually working for less than half that time - for most of it the meat sauce is simmering away and the rice is cooking without your intervention. Definitely a contender for weeknight meals! Here's an alternative idea for presentation, which I did with the leftovers for lunch the next day - mixing the meat sauce through the rice and piling it up on a plate. 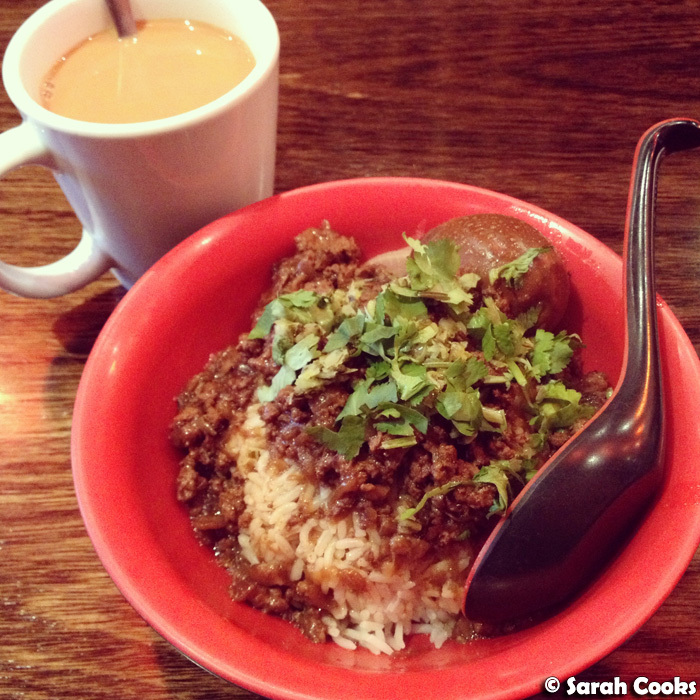 (I've only ever seen the meat sauce served on rice in restaurants here, but got the idea from Tiny Urban Kitchen). Hardboil the eggs, then peel and set aside. 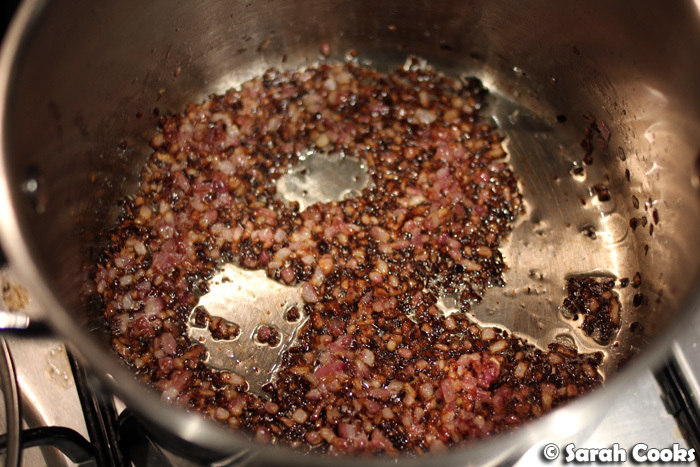 Heat the oil in a medium saucepan and add the finely chopped red onion. Cook over a medium high heat until well browned. Add the minced meat, stirring well to break it up. Cook until the meat has lost most of its pink colour. Pour in the water, soy sauce, sugar, five-spice and rice wine and stir to combine. Bring to the boil, then turn down to a simmer. 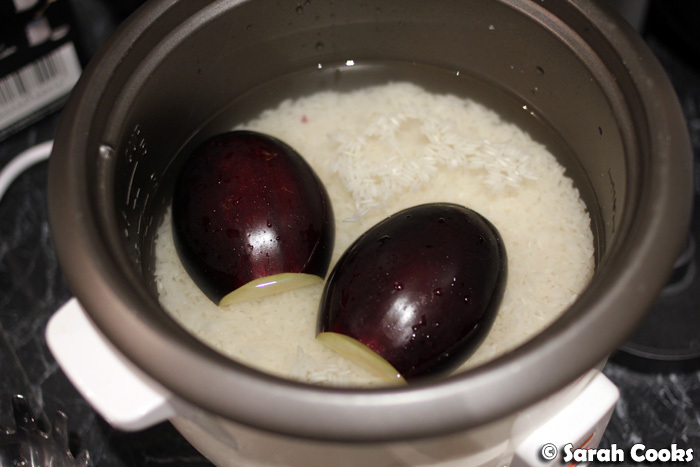 Place the hardboiled eggs into the sauce and allow everything to cook, with the pot partially covered, for 45 minutes. Stir every now and then to make sure the eggs turn around evenly in the sauce. Cook the rice while the meat sauce is simmering. If you'd like to have eggplant, slice the eggplant in half lengthwise and layer it on top of the rice and water before cooking it as usual. If you'd like to have Chinese broccoli, then cook it just before the rice and meat are ready. Bring a small saucepan of water to the boil. Add a teaspoon of vegetable oil and a teaspoon of salt, then cook the broccoli for 2-3 minutes before draining. To serve, scoop the rice into four serving bowls and use a slotted spoon or small sieve to scoop out the meat and spoon it over the rice. (There will be a lot of liquid, but that can remain in the saucepan). 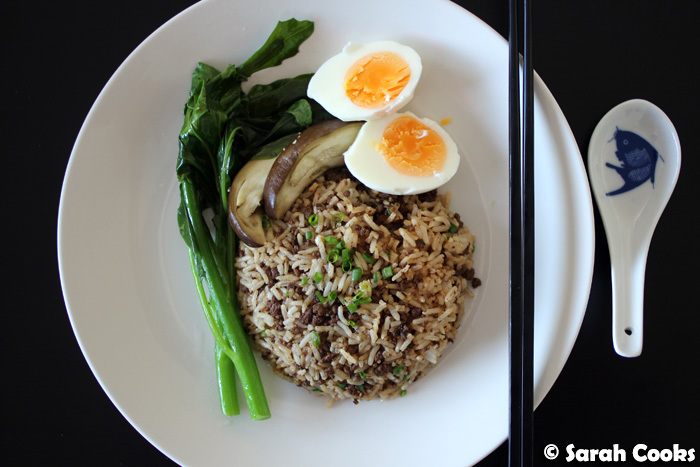 Arrange the eggs, eggplant and Chinese broccoli over each bowl. Garnish generously with spring onions to serve. 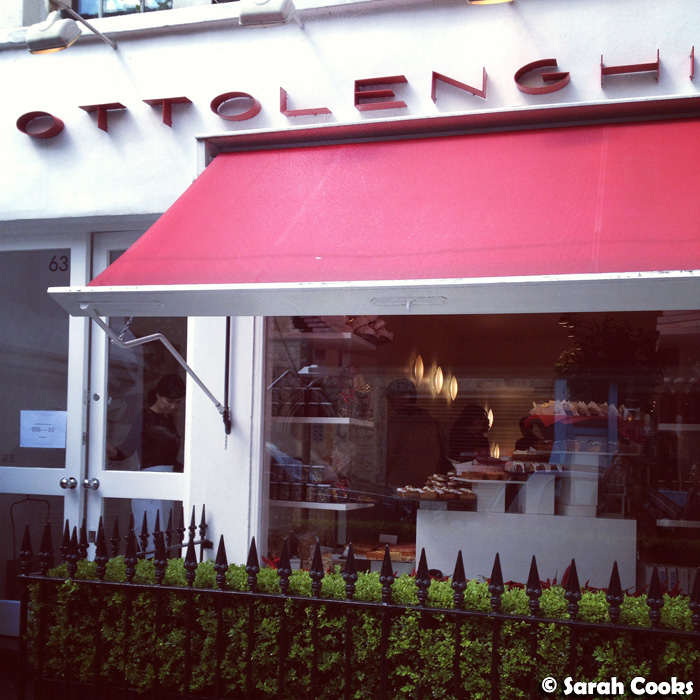 I had two days in London, and I made three visits to Ottolenghi! 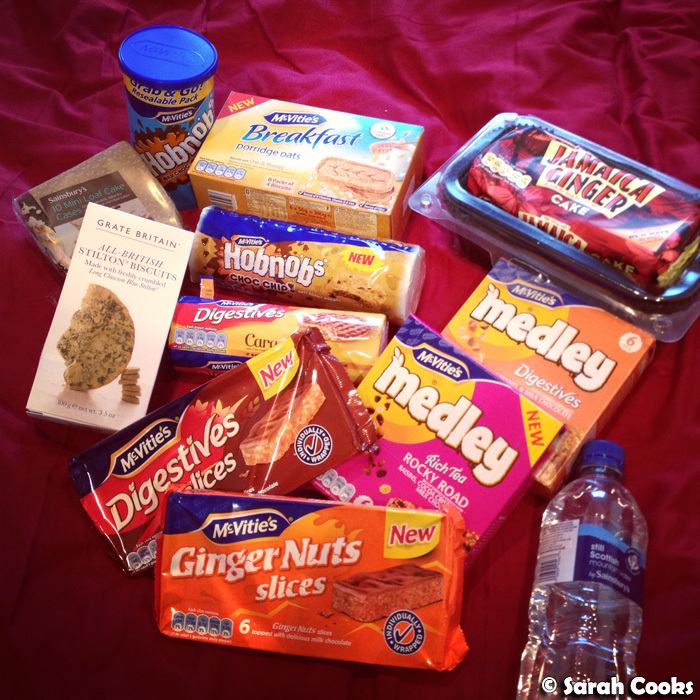 As you could see from my post: The London Weekend, my little trip to London was all about food! 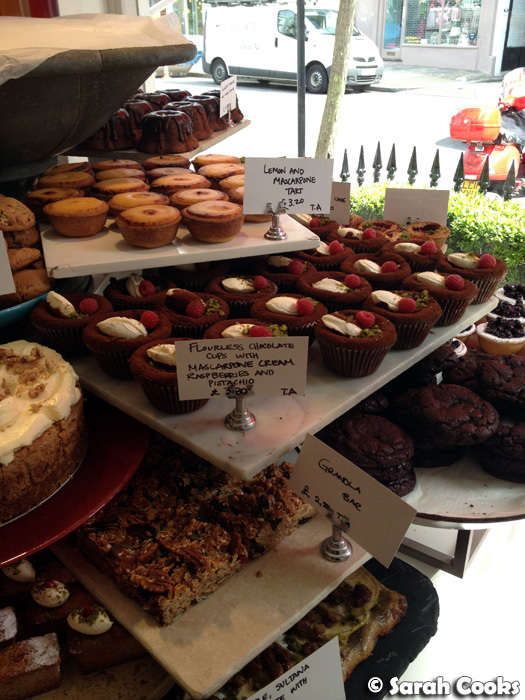 I'm a huge fan of Yotam Ottolenghi and Sami Tamimi, having cooked many of their recipes (see my "Ottolenghi" label), and I was super excited to visit one of their cafes in real life! Spoiler alert: it looks just as lovely as the photos in their original cookbook! 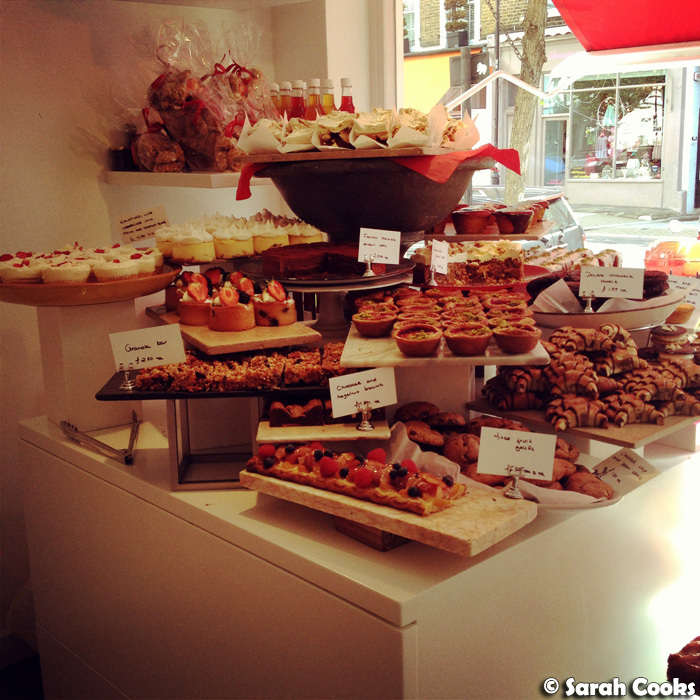 I only visited the Notting Hill branch, which was less than a five-minute walk from my fab accommodation - perfect location! In my pre-trip research, I saw that the Notting Hill branch only has a small communal table, and was concerned that we'd struggle to get a seat on the weekend (scarred by Melbourne's constantly busy and queue-plagued cafe scene, perhaps? ), and thought that we might be better off commuting to the Islington branch, which is apparently quite a bit bigger. However, after our first breakfast at Notting Hill on our first morning, I realised that it was quite low key, and that we wouldn't have a problem getting a seat there. Besides, there was certainly more than enough variety in the food to keep us occupied! (FYI there's also a branch in Kensington branch, which only does takeaway, and one in Belgravia which also has a small communal table). Food photo time! This is the breakfast spread that was available on the Saturday morning, which they kept refilling and refreshing as the morning went on. Oh wow! Way too much to choose from - I was paralysed by indecision! Here are the cakes! 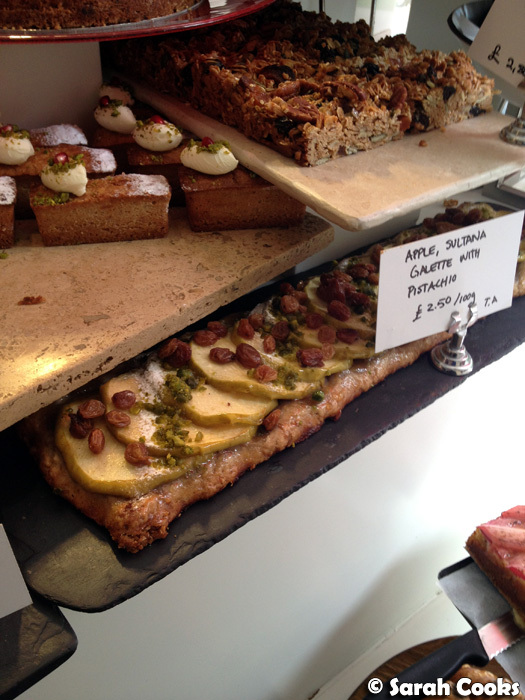 I know that here in Australia, Ottolenghi (the man and the brand) is more well-known for his vegetable-based and vegetarian recipes, but might I make a suggestion that you check out his cake and pastry recipes too? 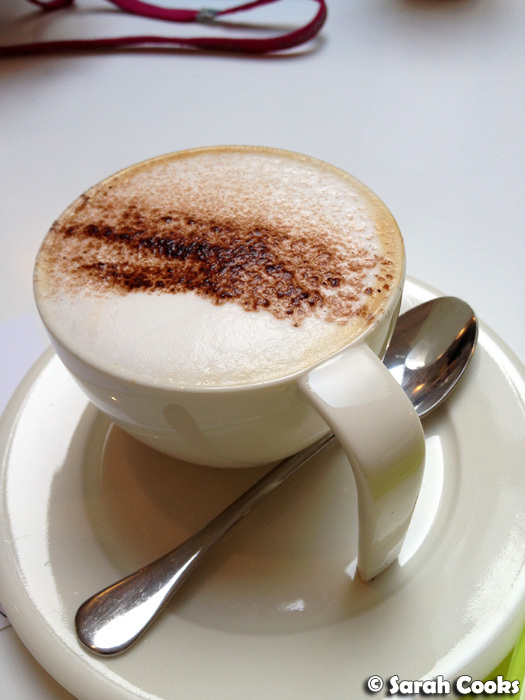 So, we secured a spot at the communal table out the back, and ordered a round of coffees to start. 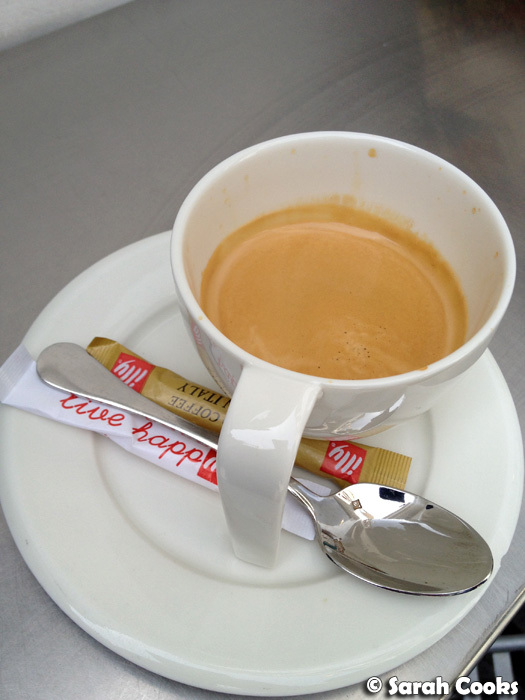 As you can see, they weren't the world's best coffees, but they did the trick. (The girl whose flat I stayed in highly rates the nearby Coffee Plant for good coffee, so that's worth checking out too). Much more exciting were the pastries. Clarice went for a muffin, which I believe was passionfruit, mango and coconut. 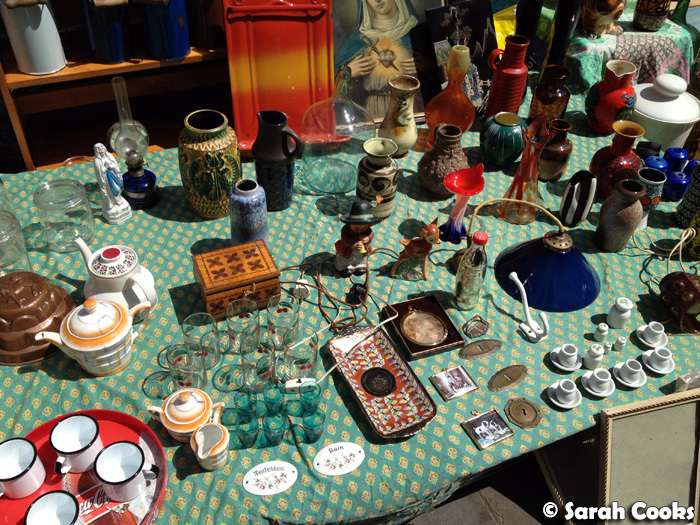 (Apologies for not remembering exactly - it was a total sensory overload that day!) 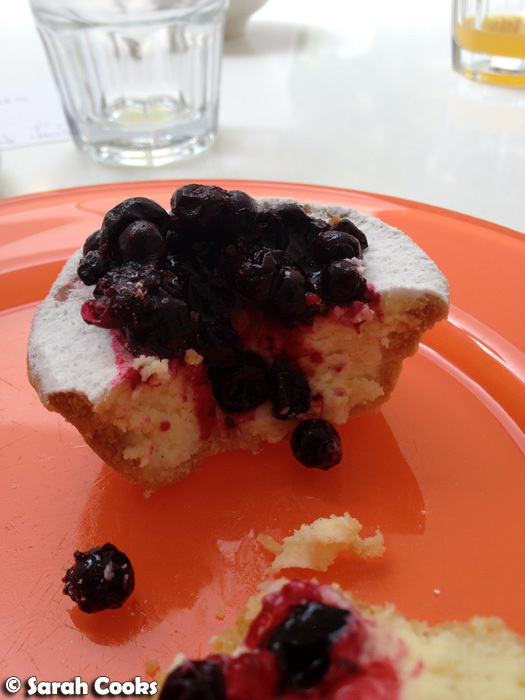 The muffin was moist and fluffy and totally delicious! 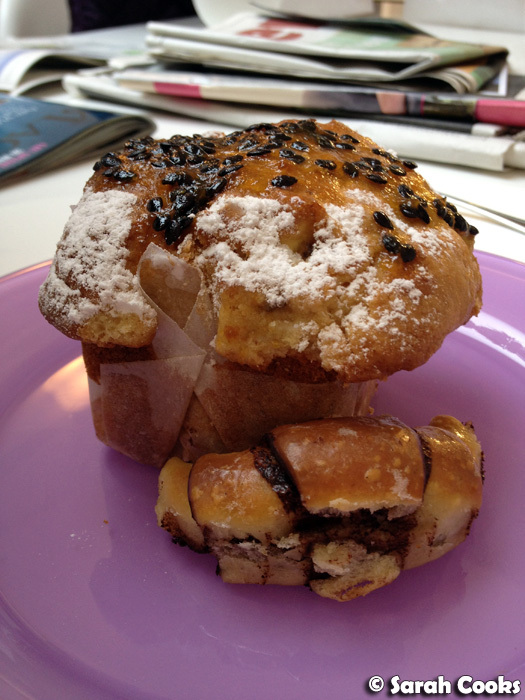 One of the guys working there generously shouted us a rugelach each, when Clarice admired them as we were ordering. How sweet of him! Now, I don't normally order rugelachs (not even at my beloved Beatrix! ), as I have childhood memories of dry and uninspiring ones that my dad would bring back after working at Jewish weddings, but I was really impressed by this one! The dough was nice and moist, with the perfect amount of chocolate on the inside, and a thin sugar glaze. 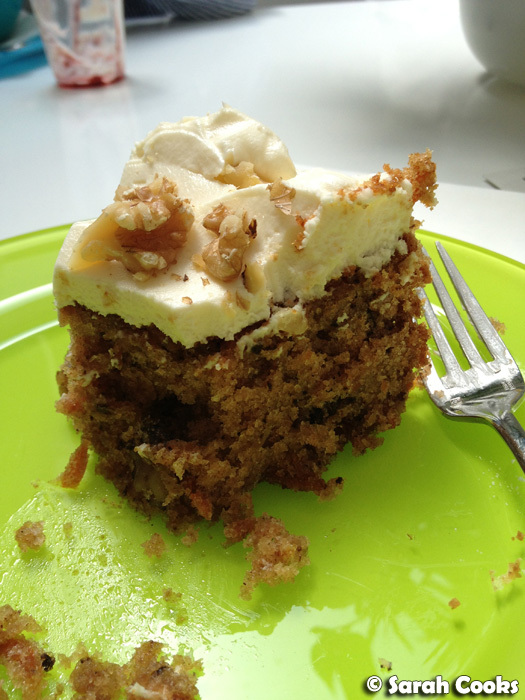 My carrot and walnut cake was ordered after much, much indecision. All the cakes and pastries looked amazing, but the reason I chose this particular cake because there's a recipe for it in the original Ottolenghi book, and I knew that if I loved it, I'd be able to recreate it at home, hehe. Yeah, totally amazing too. The cake was lightly spiced (cinnamon and cloves! 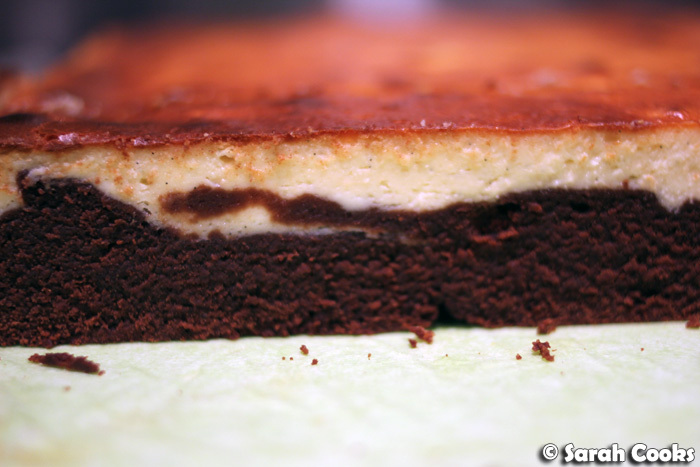 ), very moist, and was covered in a generous slick of cream cheese icing. Super love! 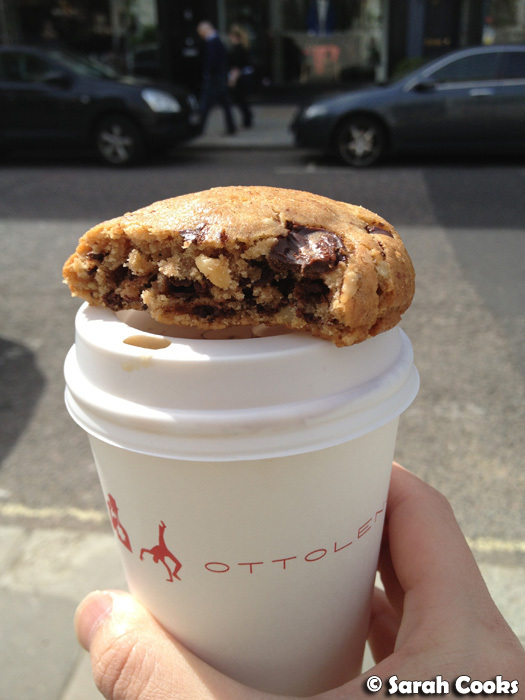 The next morning I couldn't sleep in, so early in the morning I made a sneaky little solo expedition to Ottolenghi again, picking up a cappuccino and a pecan and milk chocolate cookie and having a walk around the area. (Hot tip: most shops seem to be closed at ten in the morning on Sundays). Later that morning, there was just a short fifteen minute wait for a spot at the communal table, so we had another coffee and waited on the two stools just outside the front door. 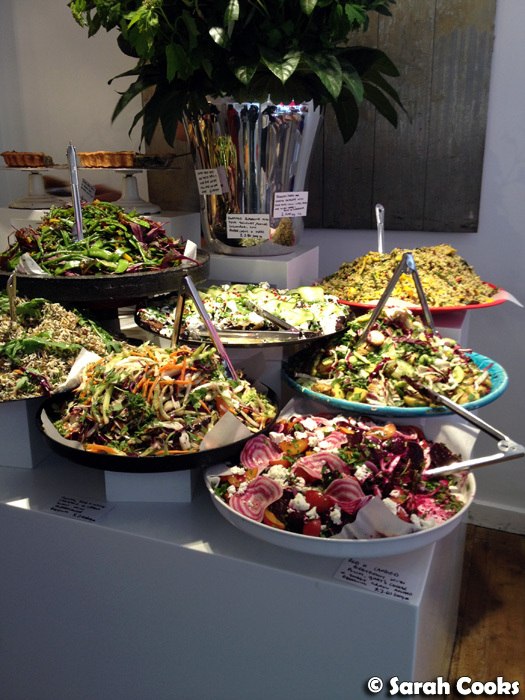 I just had to sneakily snap another pic of the salads on our way through to our seats! The roasted aubergine was very much like my favourite Ottolenghi salad of grilled eggplant with saffron yogurt and pomegranate. The sweet potato and courgette flower tortilla (thick Spanish egg omelette, not Mexican corn-based wrap!) 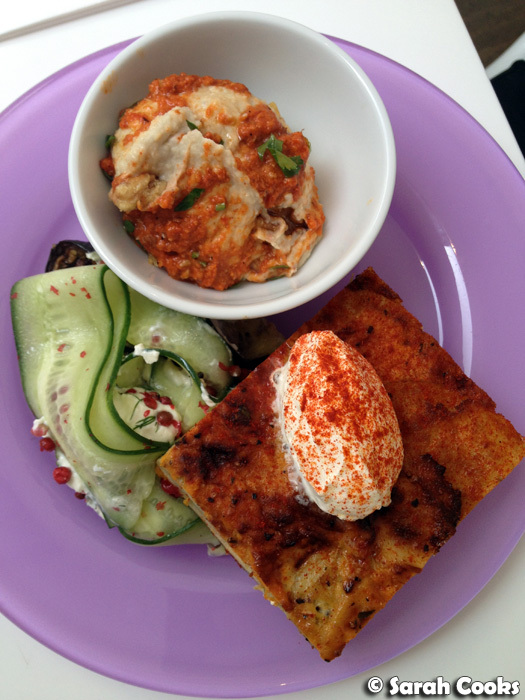 was served cold, and was complemented well by the sour cream and smoked paprika. Clarice mentioned that the butterbean hummus, whilst delicious, would have been better served with some bread or crackers, as it was essentially just a bowl of dip. I gallantly (haha) gave her some of my new potatoes to help out. 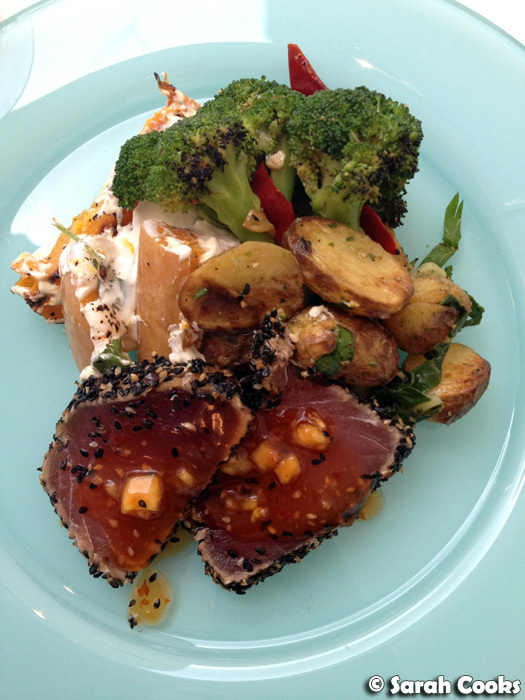 I don't really know how to describe it, except to say that all the salads were lovely and fresh, and that the seared tuna was a wonderful treat of a meal! Obviously now that I'm home, I'm frantically looking through all of his books for the same and similar recipes! Now, while Clarice and I were enthusiastically ooh-ing and aah-ing over our fantastic meal, snapping photos on our phones and being generally thrilled with the experience, there was a couple next to us where the guy (an Aussie dude, incidentally) was totally disinterested. He'd come in with his girlfriend, who appeared to be a regular, and whilst she was tucking into lunch and trying to encourage him to have a nice morning, he just sipped on a coffee, complained about his hangover, and looked at the food like it was from another planet, saying loudly: "I wouldn't wish that stuff on my enemy!" Sorry, you wouldn't wish delicious, creative and thoughtfully prepared meals, made with high quality ingredients and served with a smile on your enemies? Pff! Funnily enough, this theme of us sitting next to totally disinterested people at wonderful restaurants continued throughout the weekend - so I'll tell you more as I blog the meals. Of course, we had to have a little something sweet as well. 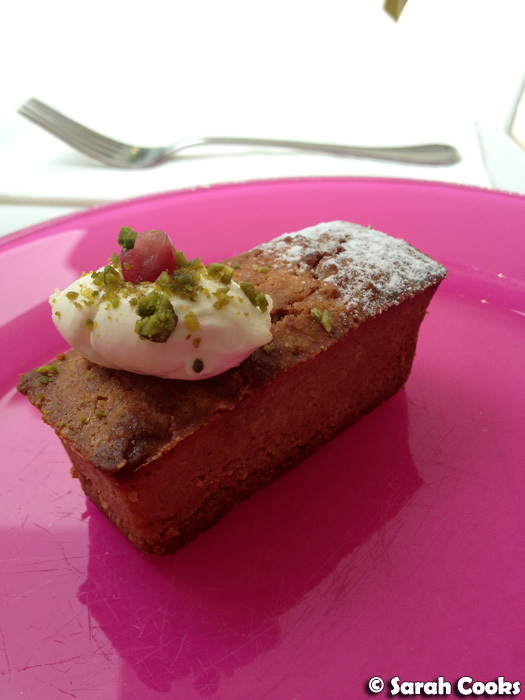 Clarice went for the Persian love cake, which was a moist, dense, almost marzipanny little loaf of almond cake, served with a little dollop of cream and a pretty sprinkling of green pistachio pieces. I chose a white chocolate cheesecake. 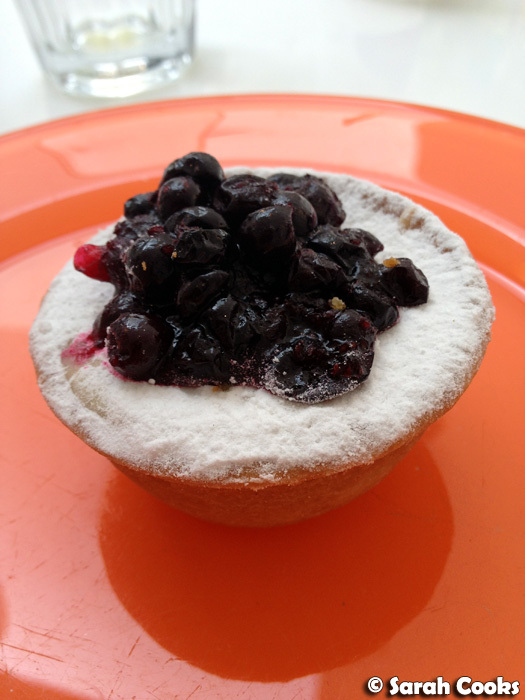 The dense, creamy, vanilla-flecked cheesecake mixture was encased in a crisp shortcrust pastry, and topped with contrasting sharp blueberries. It was really decadent and luscious - mega love! So that was Ottolenghi! Obviously it totally lived up to my hyped-up expectations, and I'm so glad that we made repeat visits over the weekend! Total deliciousness. On the way out, I couldn't resist picking up a bag of "salt caramel chocolate brittle", which I hand-carried from London to Paris, to Strasbourg, to Offenburg, to Lampertheim, through Dubai and finally back to Melbourne! 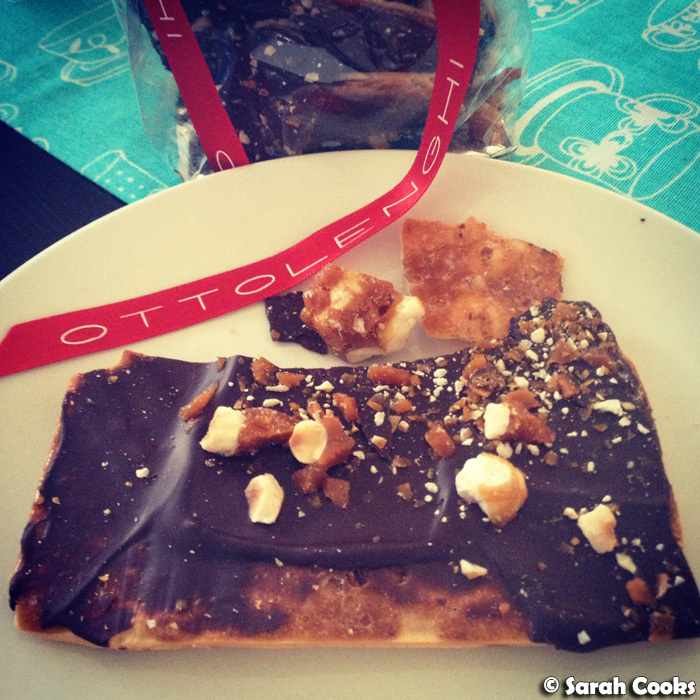 It's kinda like a lavosh cracker, topped with thin layers of crunchy salted caramel and dark chocolate, and sprinkled with crisp hazelnut brittle. I've kept it in an airtight container, and have slowly, slowly been picking at it since we came home, trying to extend the holiday! 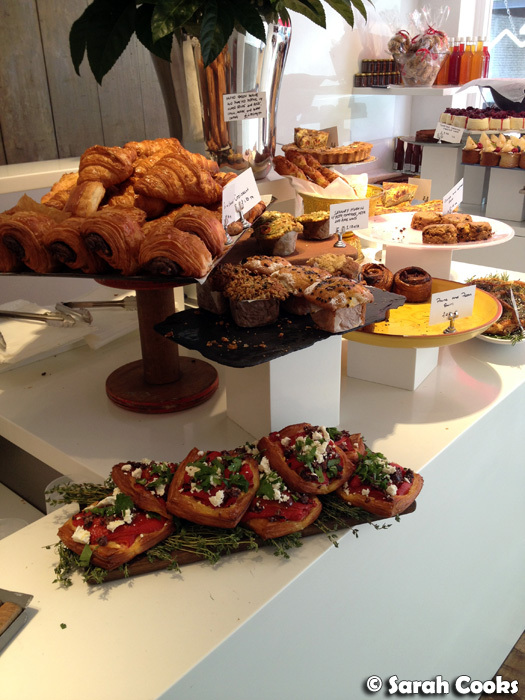 We also made a visit to Ottolenghi's restaurant, Nopi, on our first night in London - so keep an eye out for that post! Hi everyone! So I'm back in Melbourne after a fab, fab holiday in Germany! Whilst I love being at home, and am seriously enjoying our Melbourne coffees, I am totally struggling with the weather - it's so cold and it gets dark so early! (And it's only June... eep!) 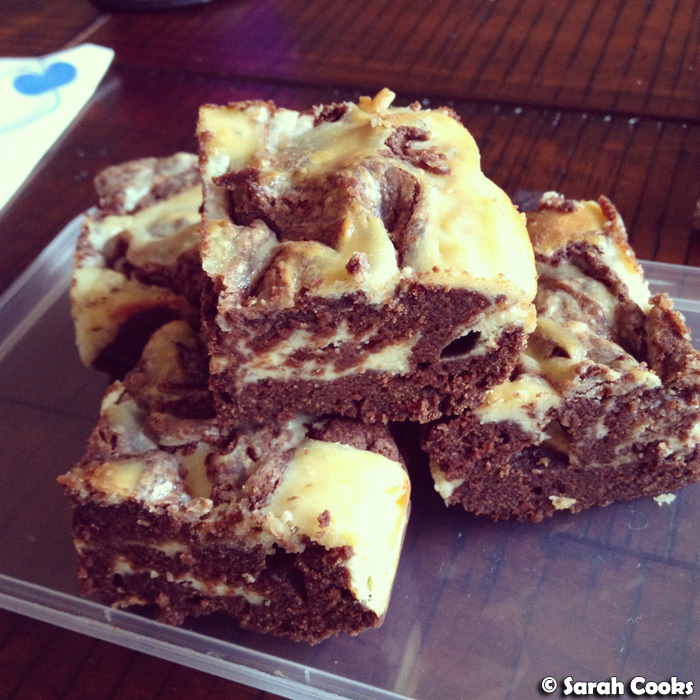 Anyway, on a happier note: today's post is about brownies! 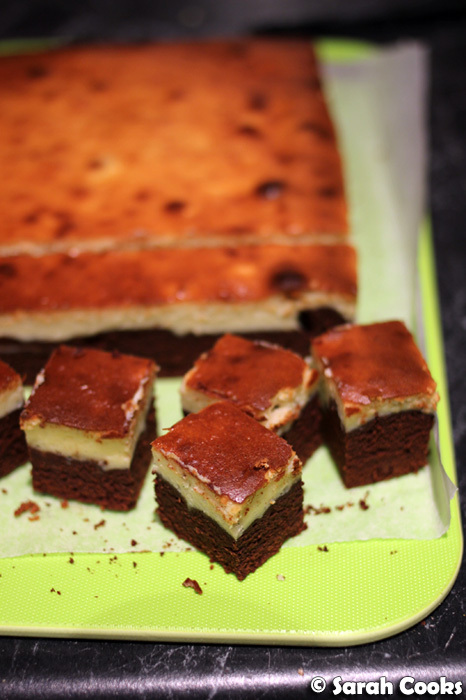 A little while ago, April from My Food Trail posted a really delicious-looking picture of some cheesecake brownies on Instagram. When I clicked "like" and commented "Omg want! ", she generously offered to give me some! Yay! I swapped her some corn fritters, and she gave me a tub of her delicious brownies. 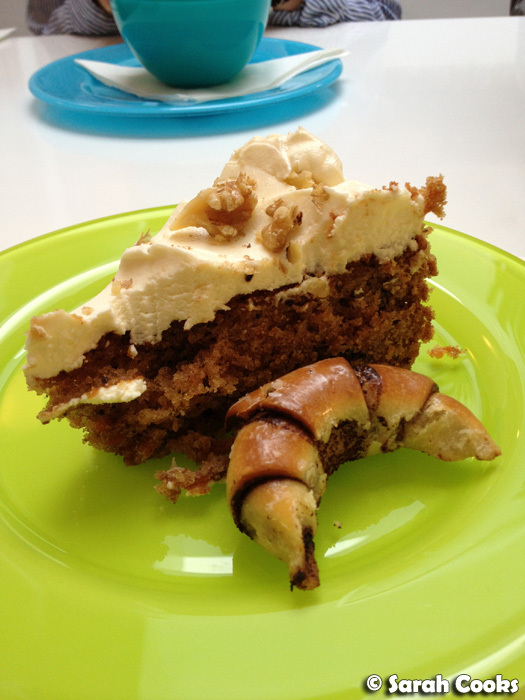 My full, adapted, recipe is below, but let's have a look at the steps involved! Here's the cheesecake component! In addition to doubling the quantities, I used a vanilla pod for extra luxuriousness. And here's the chocolate part. I love how shiny it is - must be all the butter! So as you can see, I went for the two-layered effect, but if you wanted to go for swirly marbling, then just dollop alternate spoonfuls of each mixture into the tin and then swirl with a palette knife! 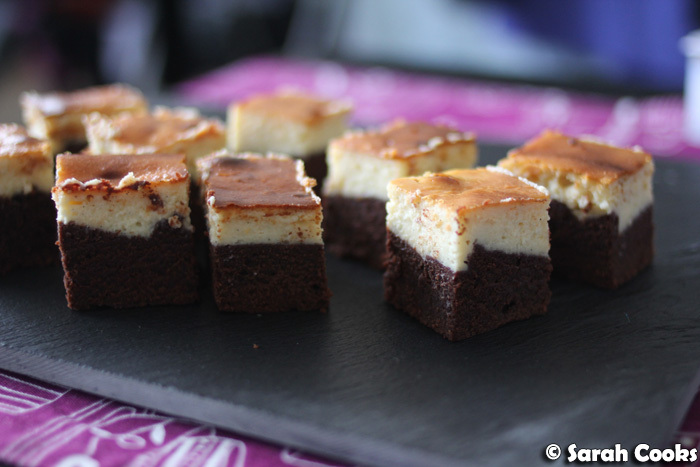 These were, as you can imagine, quite rich, so I thought they were best in little squares. I took the brownies to my old work on my last day there, and they went down a treat! 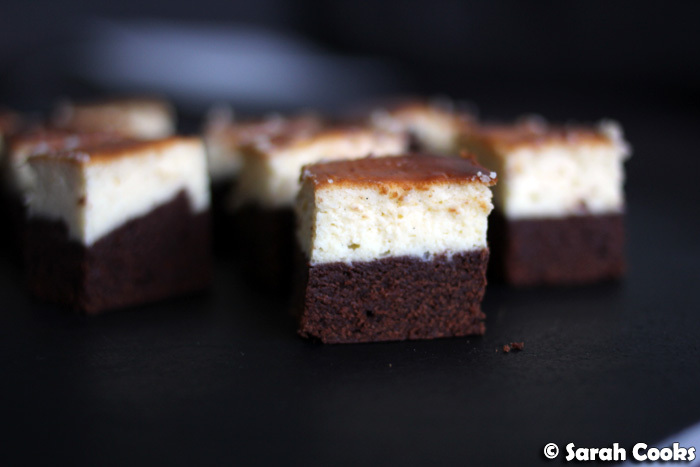 If you like brownies and cheesecake, you can't go wrong. Enjoy! 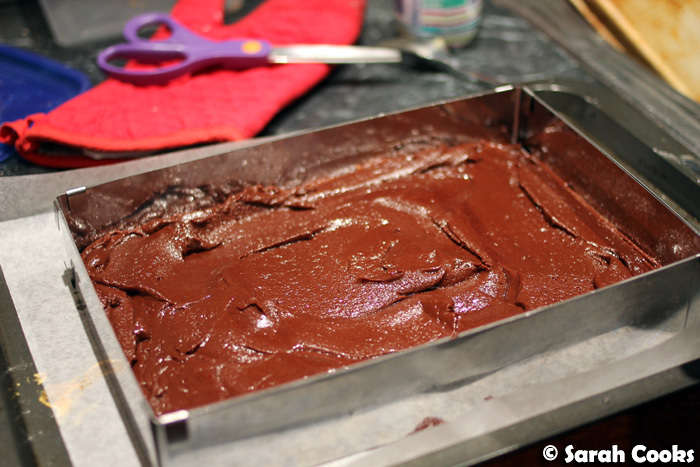 Preheat the oven to 180C and line a 30 x 20cm rectangular cake tin with baking paper. Melt the butter and dark chocolate. Set aside to cool slightly. Beat the eggs and add the sugar, whisking to combine. 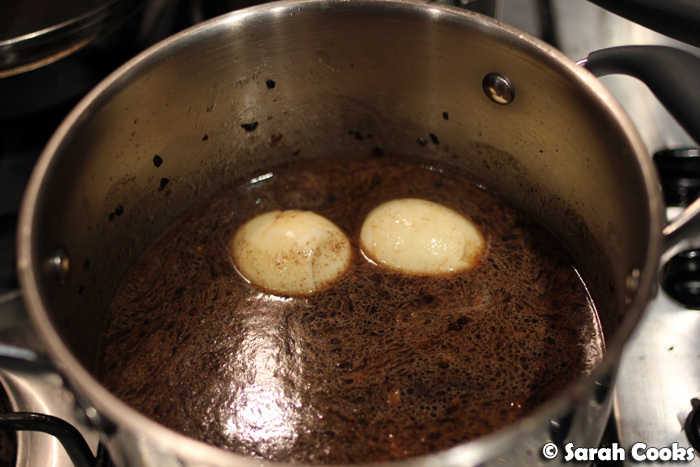 Stir the eggs and sugar into the melted chocolate. 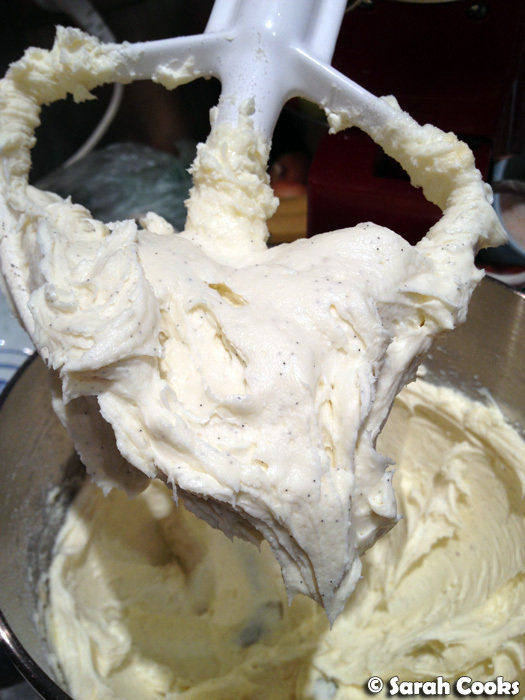 Sift the flour and salt, then whisk it in, followed by the yogurt. Beat the cream cheese until softened, then beat in the sugar, followed by the eggs, vanilla extract and the vanilla seeds. 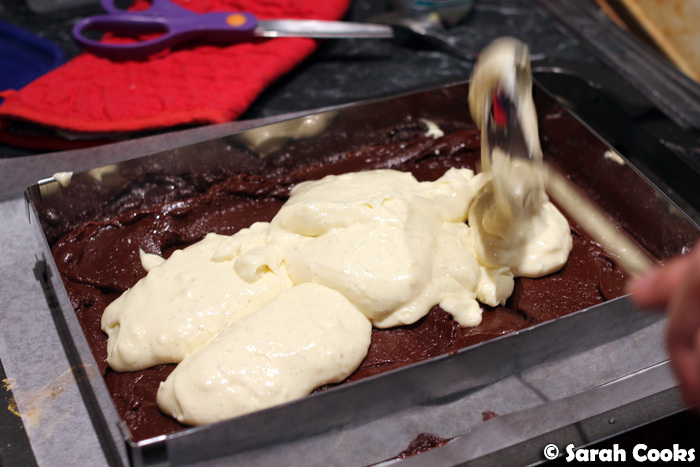 Spread the brownie base into the prepared tin, then dollop over the cream cheese mixture. 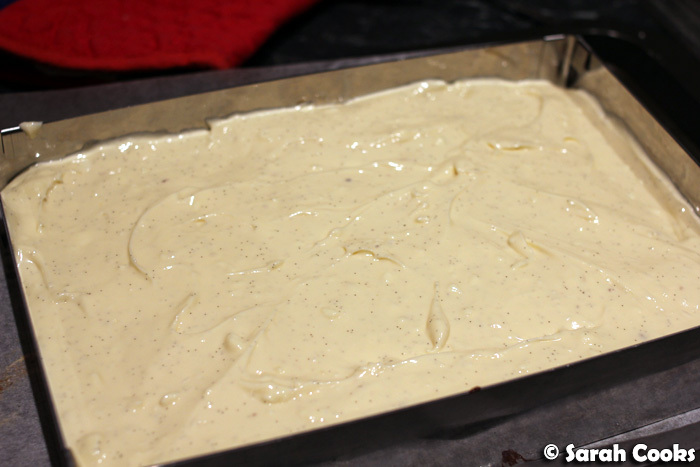 (Alternatively, for a marbled effect, drop large spoonfuls of each mixture into the baking tin and then swirl with a palette knife). Bake for approximately 30 minutes, until just set. (A cake tester should come out with damp crumbs clinging to it). Allow to cool before cutting into little squares to serve. Hi everybody! 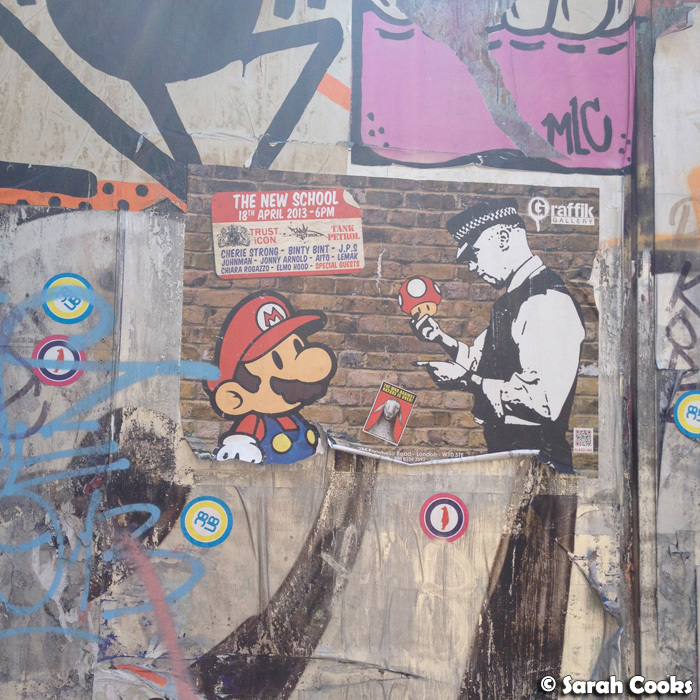 I'm back in Germany now after a fab five days in London and Paris! The weekend in London was all about destination-eating, with meals planned and booked well in advance (all organised from Australia! ), and activities arranged around the meals. Check it out! First stop was actually not in London at all, but in Paris! I took the train from Mannheim to Paris, met my friend Clarice (who lives there), and we took the Eurostar to London together. 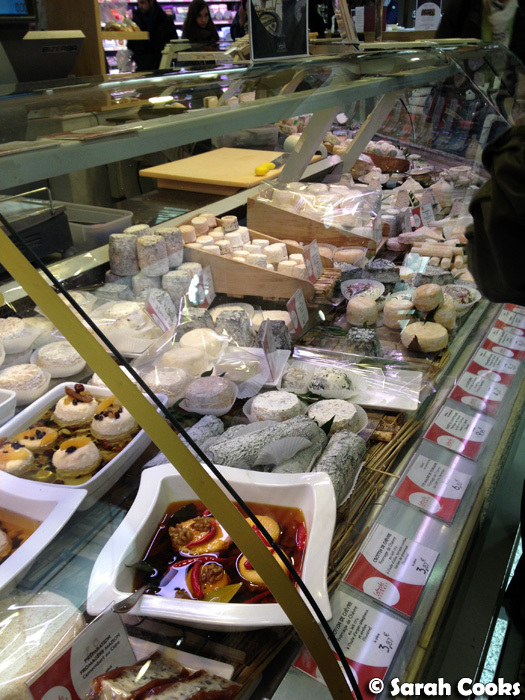 On the way to the train, we made a quick stop at Lafayette Gourmet to pick up some cheese! Woah! 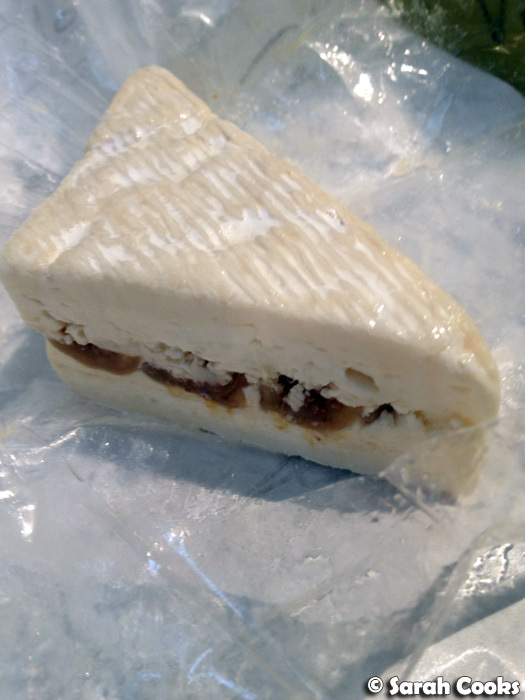 We were almost overwhelmed with choice, and in the end we picked a lovely brie with dried figs. Looks almost like a sandwich, don't you think? 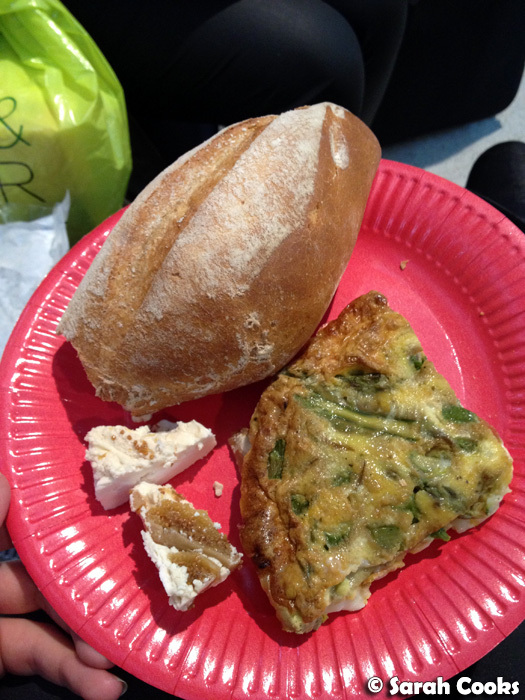 We enjoyed a very glamorous little picnic in the Eurostar departures hall before the train: the brie à la figue, Brötchen that I'd bought in Germany that morning, and an asparagus frittata made by Clarice! So, whilst in London, Clarice stayed with family, and I stayed in the most fantastic flat in Notting Hill, which I found - with only eleven days' notice!!! - on Airbnb. It was such a great find too: a lovely, modern and comfortable flat in a central location. Random fact: it only cost £17 to get a Black Cab there from Kings Cross station, which was perfect, as we arrived late at night and I was way too exhausted to navigate the Tube. I reflect, with gratitude, that the exchange rate is so very good right now. (Approx. $1.6AUD to £1.00 - last time I went to England it was $2.5AUD to the pound!) I also find it so cool that drivers of Black Cabs know the geography of London inside out, and that you don't need to direct them or anything. (Read here about "The Knowledge" that cab drivers must possess before they can be licensed). The neighbourhood was really interesting, with lots of shops and cafes, and I felt very safe walking around at night, which is always important. The owner was very sweet and we got along really well, as she was quite the foodie, and we even went out for a drink on my first night while she showed me around the neighbourhood. For my little 2-night trip, she actually took the sofa bed while I took the main bedroom, but in normal circumstances (i.e. with longer notice!) you'd have the flat to yourself. I'd feel a bit weird publishing photos of the inside of the flat, as it is actually someone's home, but rest assured that I highly recommend it. 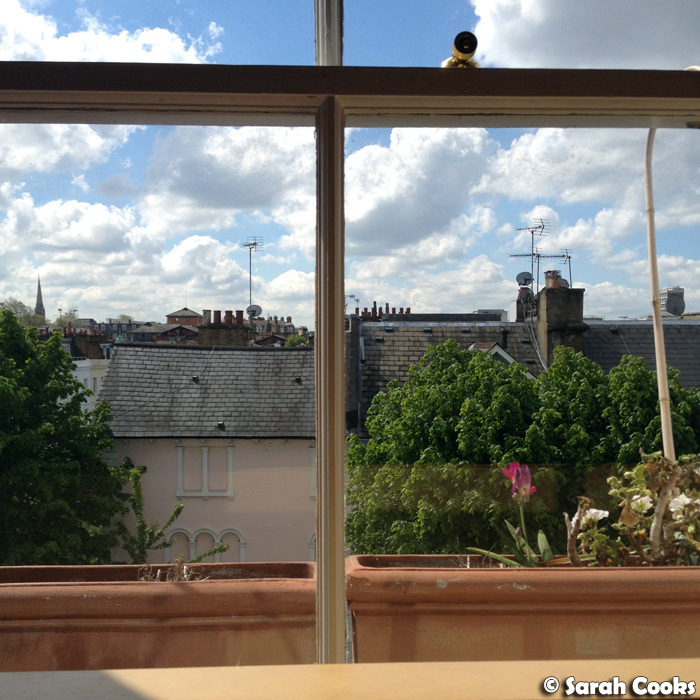 If anyone is travelling to London and is keen to stay there, let me know, and I'll happily email you the Air B&B link! Ok, so full disclosure - one of the selling points of that flat was that it's a stone's throw from the original Ottolenghi cafe! Aaaaargh! Fangirl freakout! Clarice and I visited a good three times over the two-day trip, and it was just as good as I had hoped it would be. Blogpost to come! 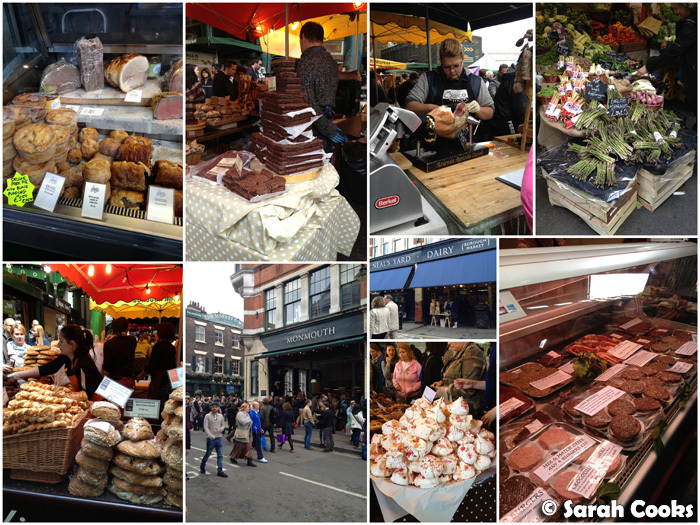 On the Saturday morning, we took a walk through Borough Market, which has so many amazing stalls and is definitely worth a look, despite being crazy busy! If I were interested in doing proper food shopping, I'm sure I'd get frustrated at all the slow-walking, camera-waving tourists! (Myself included, sorry locals!) I wonder if locals avoid the market on Saturdays and just shop during the week? Lunch that day was at Dinner by Heston Blumenthal, which was seriously delicious and amazing - we literally couldn't fault any aspect of the experience. Of course, full blogpost to come, but for now, check out this picture of their famous Meat Fruit dish! 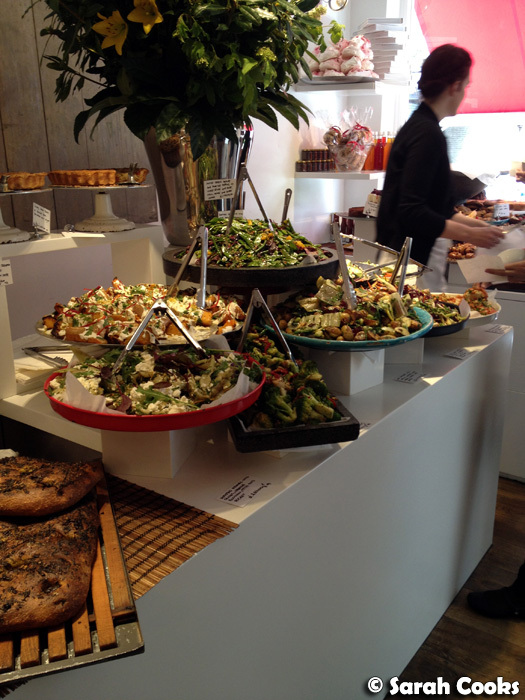 For dinner that night, we headed to Nopi, another Yotam Ottolenghi venture, in the West End (near Piccadilly Circus). 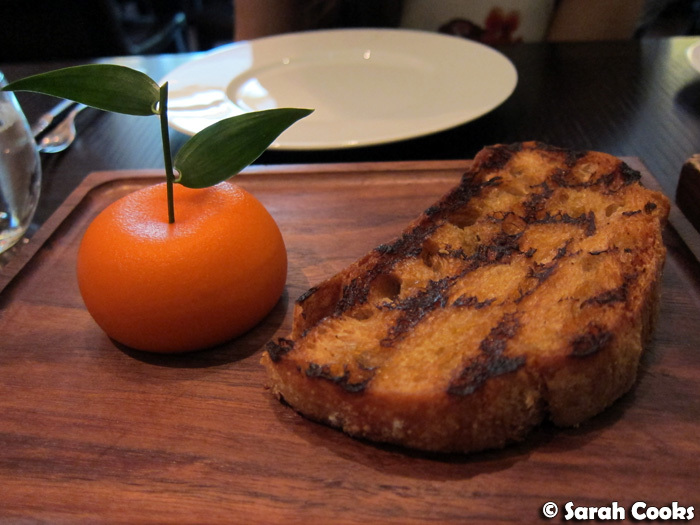 The simple, unfussy food here was a total contrast to Heston's, but equally delicious. 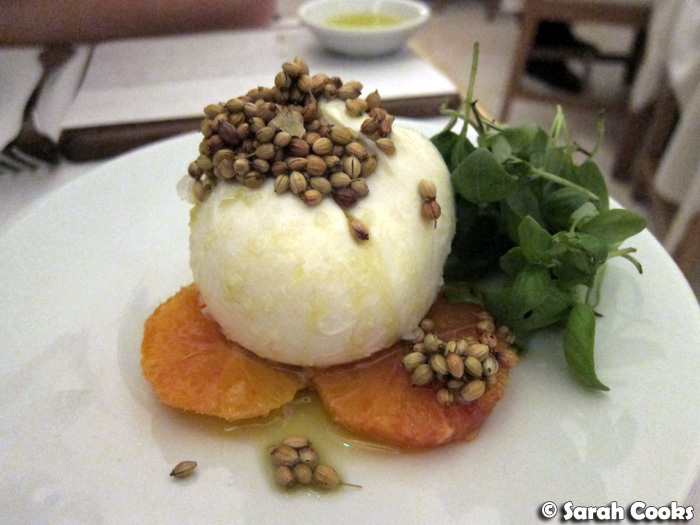 Below we have a dish of burrata with blood orange, baby basil, coriander seeds and a mild lavender oil. I'll be blogging the meal in full, of course. The London weekend happened to coincide with the Champions League final - which, funnily enough, was between two German teams: Dortmund and Bayern München - so the city was awash with German tourists (I just can't escape!) 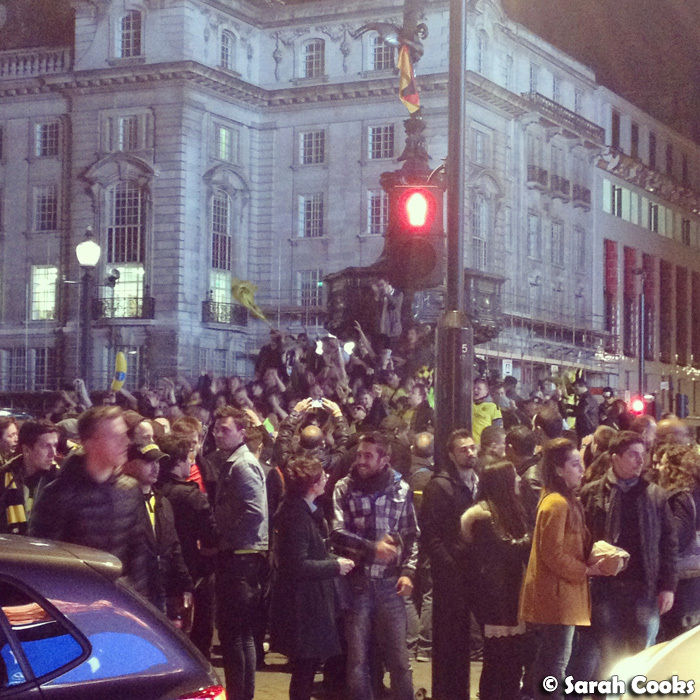 Here is the Eros Fountain in Picadilly Circus covered in spirited (but still well behaved) Dortmund supporters! 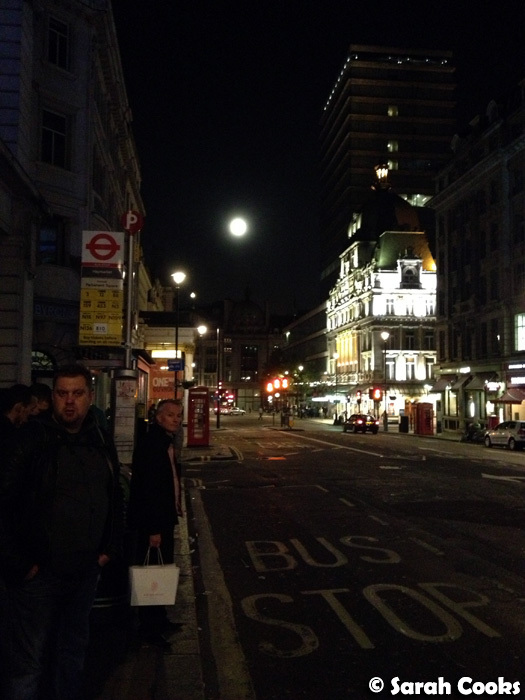 I took the below photo as we were waiting for the night bus - how beautiful was the full moon? 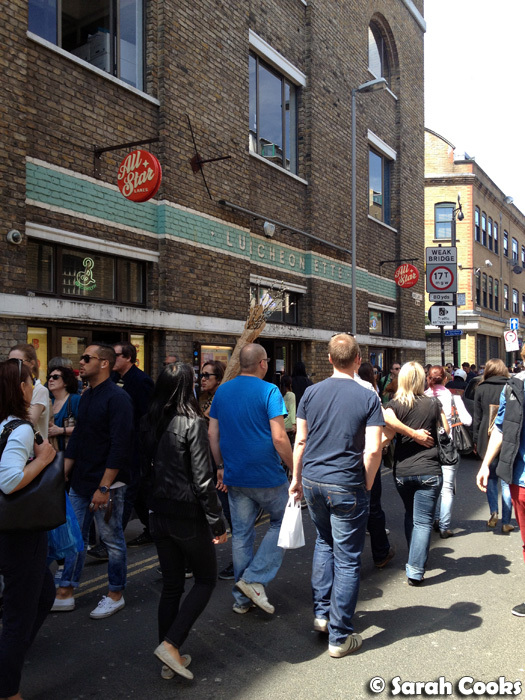 The next day, Clarice suggested we check out Brick Lane, a cool, cosmopolitan area that was once a Jewish area and is now predominantly a Bangladeshi area. 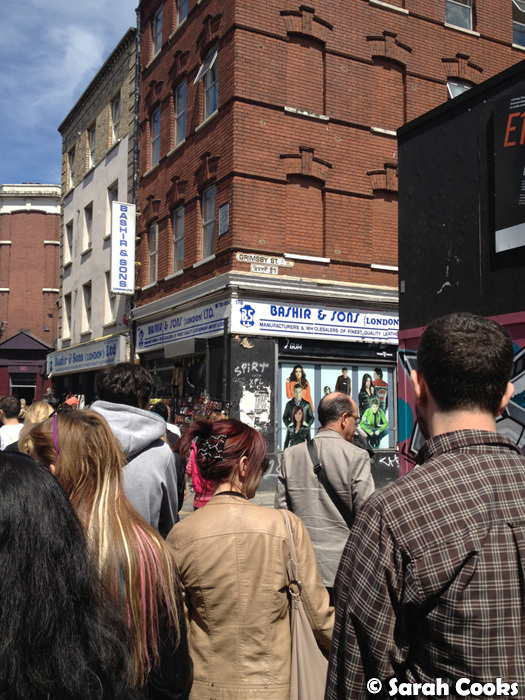 There was also a distinct hipster vibe, with street art, lots of cafes and diners, and a very busy street market. 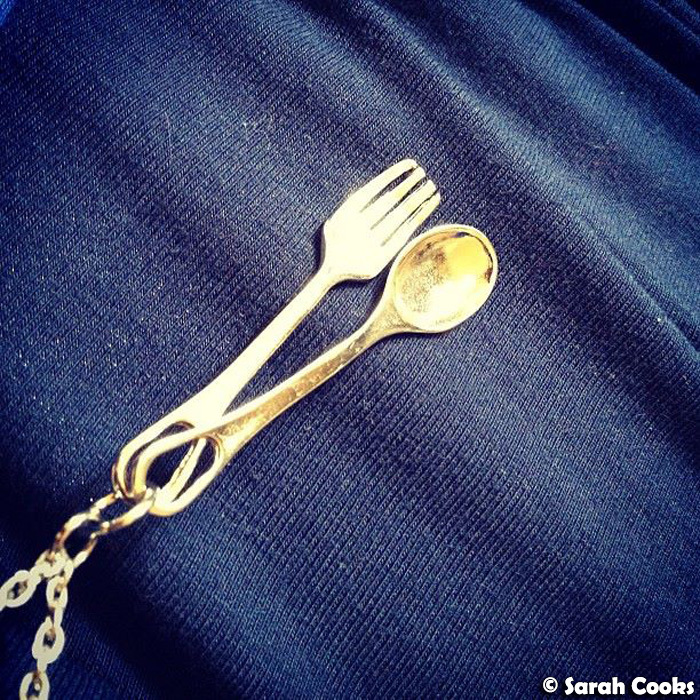 I got this super cute fork and spoon necklace at one of the markets. Only £5 and totally me! 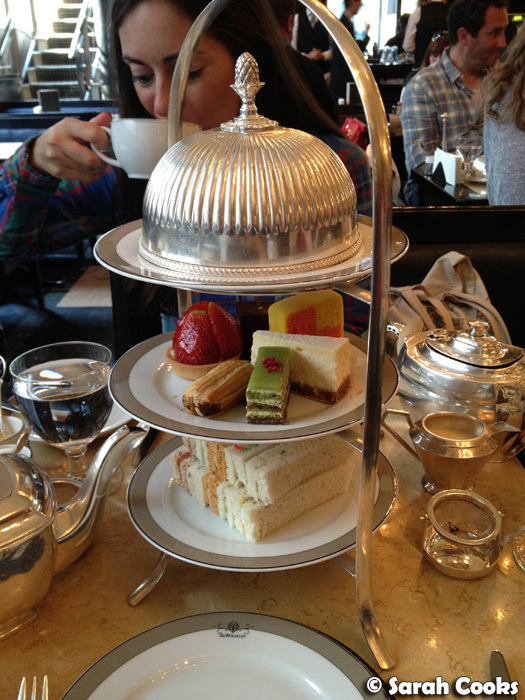 Later that afternoon, we stopped by Fortnum and Mason for an altogether posher Supermarket Sweep, and to finish off the weekend, we enjoyed a fabulous Afternoon Tea at The Wolseley! I'll be blogging about it in full too. And that was the London weekend! Such fun! The weather was great, and the food was all fantastic - there wasn't a single dud meal or item. (Except, if I'm being picky, Ottolenghi's coffee, which couldn't compare to its amazing food, but I think Melbournians are quite spoiled when it comes to coffee!) I'm looking forward to blogging all the different meals! Yay! Posts about my previous trip to London are categorised under the label: "London 2006".